"I think I'll do it again next year. I hope I can live up to it again." That's what John Dale said when asked about the possibly of repeating Band City Fest in 2019. The all day summer music and art festival took place on Saturday and, although it was, in his mind and in the minds of many who attended, a great success, it certainly didn't go off without a few hitches. But first, lets talk about the positives. 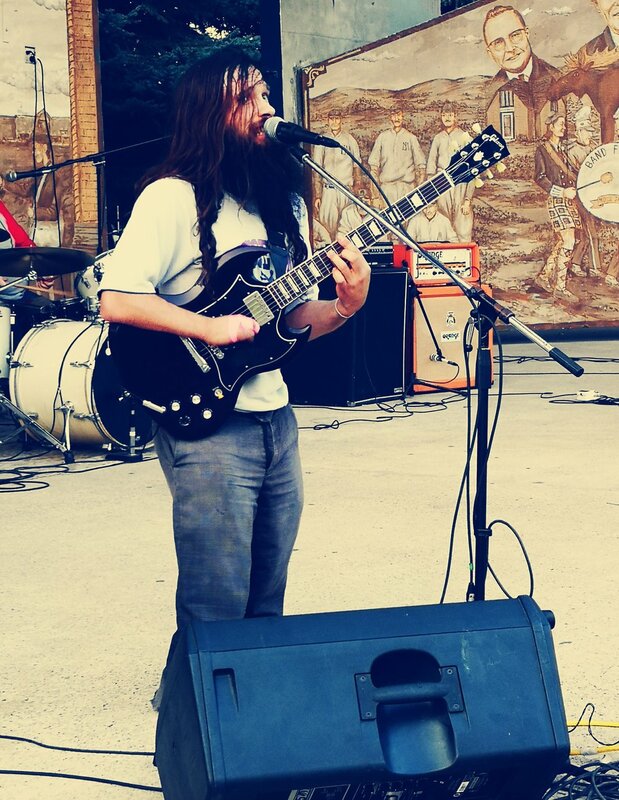 John Dale, the frontman for Johnny 2 Fingers & the Deformities, one of the most popular bands to ever come from the friendly city, was the organizer and curator of 2018's Band City Fest. The outdoor summer music and arts festival sold 235 tickets. That, he claims, is more than enough to justify doing it again next year. But 235 tickets sold is only a small representation of the amount of people who showed up and took in the show. Children under 15 got in free; and there were plenty of children there plus it was very easy for people to just walk in without paying, so John and his festival help have found it rather difficult to get an actual reading of the turnout. Either way, he seems pleased with the outcome. "There's always going to be people who sneak in" he said. "This was sort of an experiment into how many people are honest." John expressed gratitude for all the bands who performed. The event happened "serendipitously" he said. It all began with a chance encounter with friends of his in a Red Deer band called The Pits. They were going to be around Moose Jaw on August 25th so he asked around about getting some bands to play a show at the Crescent Park amphitheatre with them. The response was great so he turned it into a festival. This is the origin story of Band City Fest. The Pits. The band responsible for the creation of Band City Fest. "It was great to have Megan Nash there" he said. "She's so good. She brings in such a good crowd. She just about sells out the Mae Wilson theatre so it's nice to have her singing this amphitheatre." 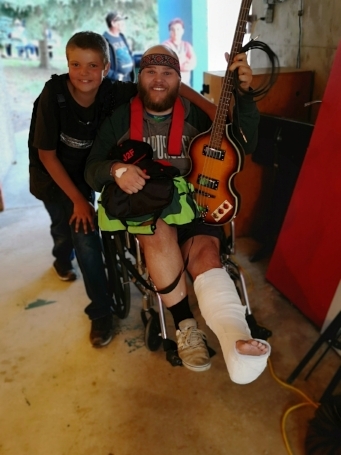 On the morning of the event, his bass player Travis Geib slipped on the rocky waterfall to the east of the amphitheatre stage and broke his ankle. Immediately Johnny 2 Fingers & the Deformities were short an integral part of their live performance. Travis Geib nursing his broken ankle. Pictured with him is Michael, Band City Fest's security guard. "We were so busy with things that we were just sort of numb to it" John said, adding "we left him alone for twenty minutes." Thankfully Steve Leidal, who has played some shows with the band before, was on hand. "Thankfully it happened early enough in the morning that Steve was able to go home and run through all the songs. He did a really good job. I'm really impressed" John said. John was pleased with the response he got from people in the audience. "Other people were immediately excited" he said. "Many people have already offered to help out next year." For next year, John would like to put a few improvements into place. "We're gonna upgrade the soundsystem" he said before acknowledging that the audio wasn't a great as it could have been. He then told an anecdote about the 86s set, in which, no matter what he tried, he couldn't conjure up clean, understandable vocals. John would also like to set the park up in a way where it's a little more difficult for people to sneak in. He is considering stringing a barricade up to the trees surrounding the park and maybe adding a few more booths taking tickets. "I'd like to have a beer garden, too" he added. "That's a lot of work and a lot of liability though." The Festival ended at 10pm and an afterparty concert took place at The Park Hotel. But sometime between then and early this morning some vandalized Crescent Park. They destroyed some benches and graffitied the amphitheatre stage with swastikas and crass language. "It's sad" John said. "When I saw it I was bummed. I don't know what happened. Everyone said they had a great time." The good people of Moose Jaw, with the help of city workers, were down in Crescent Park early Sunday morning repairing the damaged property. It is not known who did the damage and whether or not they had any connection to Band City Fest. For more on that story and to see pictures of the damage read Crescent Park Vandalized and Graffitied.